It is a bit tired to say that Google’s stranglehold on the search engine market seems unshakeable. To offer a couple of ironic factoids, I found the accompanying image using Google Image Search, and this blog is published in Blogger, a Google-owned service. 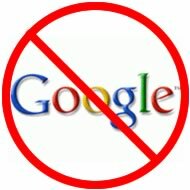 Many people have been warning us about Google’s dominance for a while, yet we continue to use it for a variety of reasons, from convenience to the fact that it works well. Spiegel Online has published a very interesting article on the growing backlash against some of Google’s more controversial services, such as StreetView, but also building a disturbing picture of the amount of data mining going on at the Mountain View company. Gmail users have become accustomed (and immune) to warnings about the practice of Google searching for keywords in their messages to target contextual advertising. iPhone users can also be tracked when using Google Maps in their mobile devices, which tell Google exactly where you are. The practices at Google cut right to the heart of the modern debate about Internet privacy that is usually the topic of discussion in various conferences I attend. Those who do not see privacy breaches as a problem, tend to offer three arguments. One is whether there is safety in numbers. With the amount of data that Google gathers, is it possible for any person to actually misuse it? Your personal information is lost in petabytes of meaningless noise available online, so it is unlikely that someone will actually access it. The other argument is, so what? If the user gets a free and useful service, who cares if the company makes a buck by providing context advertising to the consumer? The third is of course the issue of privacy itself. If you have nothing to hide, then why bother about what information is held by Google or any other company? These are legitimate answers to the issue of privacy, but I cannot help being slightly worried by the far-reaching power of Google. I am also concerned about the environment of unaccountability in which Google is allowed to operate. In Europe we have data protection law for a reason, and perhaps it is time for regulators to look at Google’s practices and start asking questions about lines crossed. It is clear that privacy is a growing concern in the media due to the widely advertised privacy blunders by government officials. We also have a public debate prompted by the Daily Mail editor riling about growing privacy protection due to human rights legislation. If privacy is back on the menu, then the largest online perpetrator should certainly come under regulatory scrutiny, regardless of whether one believes that its practices are not such a big threat to our rights.